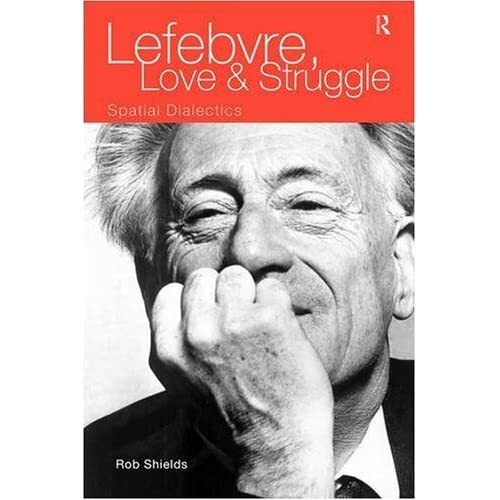 A seguir, uma recensão do livro de Rob Sheilds sobre Henri Lefebvre ( Henri Lefebvre - Love and struggle, spatial dialectics, London: Routledge, 2000). Henri Lefebvre (1901-91) was an independent French Marxist theoretician. An original, nonconformist thinker, Lefebvre was a prolific writer; in his lifetime, he published more than 60 books and 300 articles! In spite of his importance, very few studies have been devoted to Lefebvre's thought. Lefebvre was the first to make accessible to the general public key writings of Marx and Lenin that were unknown outside Russia and Germany. Marx's early writings, such as the 1844 MANUSCRIPTS, were first published in Moscow in 1932. Lefebvre, with Norbert Guterman, published the first foreign language translations in 1934. In 1938 he was responsible for the first foreign-language translation of Lenin's NOTEBOOKS ON HEGEL AND THE DIALECTIC. Lefebvre also published the same year an anthology of key extracts from Hegel's writings. Until then Hegel's philosophy was virtually unknown in France (Wahl and Kojeve had just begun their Hegel seminar) and Marxists ignored it. Lefebvre wrote the first major theoretical work to advance a new reconstruction of Marxism on the basis of Marx's early work and Lenin's writings on Hegel and the dialectic: DIALECTICAL MATERIALISM (1939), published the same year as Stalin's DIALECTICAL AND HISTORICAL MATERIALISM. The contrast couldn't be greater. His conceptual innovation is to have shown the centrality within Marx's thought of the concepts of "humanism," "alienation," "fetishism," "praxis," "total man." His originality is evident if one compares his methodological understanding of Marx and Lenin on dialectical materialism with the writings of Maurice Cornforth or, for a recent example, John Rees' ALGEBRA OF REVOLUTION. Two important works by Lefebvre not discussed by Shields are MARXISM (1948) and his 1956 book on Lenin. Alienation and the dialectic were the cornerstone of Lefebvre's reading of Marx. The author notes that by extending alienation into the key concept in an entire critique of modern life, Lefebvre oversimplified Marx's and Engels' different uses of the concept. By extending the scope and meaning of alienation, Lefebvre had somewhat misread Marx. However, it is debatable to say that, for Marx, alienation was specific and restricted to the economic sphere. It is unfortunate that Shields doesn't discuss some of Lefebvre's contributions in more detail. In 1947, for example, Lefebvre wrote a book called FORMAL LOGIC AND DIALECTICAL LOGIC, a brilliant systematic treatise written from the Marxist viewpoint. His philosophic testament, RETURN OF THE DIALECTIC (1986), is also virtually unknown. Lefebvre is also significant for being perhaps THE first Marxist to recognize the importance of Nietzsche. His 1939 defense of Nietzsche against appropriation by fascists and vilification by Marxists is perhaps the best Marxist analysis of the thinker that has been written. Shields is right to note that Lefebvre is "an exemplary reader of theory as well as a radical producer of non-systematic theories but key insights and methodologies. In so far as this is true his work remains open-ended: a toolkit for progressive action now." Lefebvre innovated by extending Marxist analysis to the sphere of "everyday life" and problems of urbanism--questions that had been ignored by the Left. He witnessed after World War II the rapid modernization and urbanization of French life. His critique of the "bureaucratic society of controlled consumption is reminiscent of Marcuse, but suffers from a certain impressionism. Lefebvre made a more significant contribution by making the city an object for Marxist thought. For Shields, Lefebvre's lasting contribution will be his 1974 book on THE PRODUCTION OF SPACE, which redirected historical materialism towards a spatial problematic. This is the best part of Shields' book. Lefebvre transcoded the dialectic into spatial terms. "What exactly is the mode of social relationships?" he asked. "The study of space offers an answer according to which the social relations of production have a social existence to the extent that they have a spatial existence; they project themselves into a space, becoming inscribed there, and in the process producing that space itself. Failing this, these relations would remain in the realm of 'pure abstraction,' that is to say in the realm of representations and hence of ideology: the realm of verbalism, verbiage and empty words." From this Lefebvre develops a rich theory of the development of different systems of spatiality in different historical periods. His history of the different "modes of production of space" completes Marx's analysis of modes of production in urban, attitudinal and environmental terms. This is not just a theoretical question. A communist revolution must not only change the relationship of the proletariat to the means of production, but also create a new spatialization. His theory provides a bridge from Marxist thought to environmental politics. Lefebvre advocated alternative and revolutionary restructurations of institutionalized discourses of space and new modes of spatial praxis ("differential space"), such as that by squatters or Third World slum dwellers, who fashion a spatial presence and practice outside the prevailing norms of enforced capitalist spatialization ("abstract space"). As a dialectician, Lefebvre understood that space and time were two categories that couldn't be separated. Before his death, he was working on a "rhythmanalysis" to link different rhythms (cyclical, linear, etc.) with different modes of spatiality. The book doesn't emphasize enough how Lefebvre's thought was always intimately connected to political practice. Although for most of his life he was a university lecturer, he was never an "academic Marxist." Lefebvre always sought to unite thought and action. He was a member of the Communist Party of France from 1928 until he was expelled in 1957 for his heretical ideas. He later associated with a variety of left-wing movements and causes. His books are echoes of all those struggles. One must read his books on urbanism and the city for example, with the battles between local communities and the planners and speculators regarding "redevelopment" and "slum clearance" in mind. His studies on rural sociology are related to the struggles of peasantry. Lefebvre recognized the importance of so-called new social movements, like anti-racism or the struggles of oppressed nationalities like the Basques. Shields' book is to be welcomed for defending the contemporary relevance of Henri Lefebvre's contributions. Qu'est ce qui se passe en France? O que cruza a estação da vida?